Our latest featured resource at the Portland State Library is Artstor. This database has an immense collection of images, as well as tools to make it easy to use and download images. Furthermore, it has tools to help in teaching. Maximize your art and art history research when you use Artstor alongside PSU Library guides. 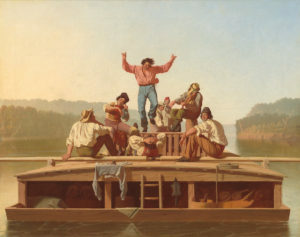 The Jolly Flatboatmen by George Caleb Bingham, 1846. From the National Gallery of Art. Researchers may browse through Artstor, or search for something specific. Categories like geography show artwork from a specific country, and classification reveals specific types of art. The art spans traditional art like painting and illuminated manuscripts, and also to architecture, film, landscape, and many more types of art. Researchers may also browse by specific repositories. This can be useful because for researchers art repositories often group similar types and styles of art, and often have a lot of background information to help with research. Additionally, Artstor has tools to help researchers manage images. Group images together to organize them, and also download them in bulk. Furthermore, bulk downloads include citations and other information about images, making it easier for researchers. Artstor also has teaching resources to help users design curriculum for all age groups and levels, from K-12 to experts. These resources span across the many different types of art and art history resources in the collections. Most importantly, scholars can share the images in research and instruction because all content is cleared for educational use. 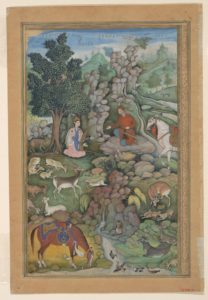 Folio from an illustrated manuscript ca. 1597-1598. Image from The Met Museum. PSU Library’s Open Educational Resources Guide connects researchers to open texts, streaming images and media, Portland State materials, and other open access resources that are useful to researchers. Additionally, anyone across the globe can use these resources, including students who have graduated from PSU. This is because Open Educational Resources (OER) are teaching, learning, and research materials in any medium that reside in the public domain or have been released under an open license that permits their free use and re-purposing by others. PSU Library’s subject guides connect researchers to resources for subjects taught as Portland State. Our architecture, art and art history guides have links to find scholarly articles, books, reference books, primary sources, as well as citation help. PSU Library’s art databases connect researchers to many other kinds of resources on arts and the humanities. These span across history to the present, as well as across many different regions and types of resources. PSU Library’s A-Z list of databases shows which resources are restricted or open access. Some PSU resources, including Artstor, are restricted off-campus to current PSU students, faculty and staff. A locked padlock ( ) indicates resources that are restricted off-campus. Conversely, open access resources are available to all researchers across the globe. An unlocked padlock ( ) indicates open access resources. 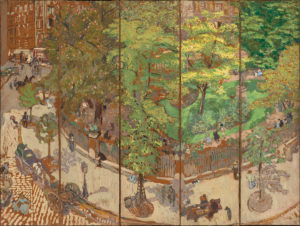 Place Vintimille by Edouard Vuillard, 1911. From the National Gallery of Art. Many US museums help researchers find images online through digital libraries, letting researchers worldwide experience the arts. Metadata in these collections informs researchers about the item, its context, and usage rights. This makes easier to determine if the items are open access or free of copyright restrictions.